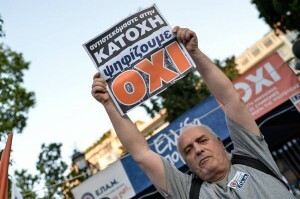 Despite the pain it presages, Sunday’s overwhelming “no” vote at least leaves little doubt about where the Greeks stand. Greeks have rejected Europe’s latest bailout offer even after experiencing a taste of the ugly potential consequences of doing so—capital controls, limited ATM withdrawals and a banking crisis. Now they will have to live with those consequences. It’s true the Greeks were given two bad choices, but they still chose the worst. Europe was offering more money to forestall a crisis in return for pension cuts and other reforms. Greek Prime Minister Alexis Tsipras claimed a “no” vote would help him extract better terms—by which he means even higher growth-killing taxes in return for fewer pension cuts. The Greeks chose the Tsipras ultimatum strategy, so they can’t blame the Germans for what comes next. The big question now is whether German Chancellor Angela Merkel and other Europeans will flinch. Mrs. Merkel has not wanted to be seen as driving Greece from the eurozone, and the referendum means that the Greeks will have driven themselves out, if that’s what happens in the coming weeks. Mr. Tsipras will claim he has a mandate to demand more European concessions, but that mandate ends at the Greek border. He has no open-ended claim on the other taxpayers of Europe. Yet as the Greek government runs out of money this month, Mrs. Merkel and the European Central Bank will come under considerable pressure to bend. This pressure will increase if there are bread lines or violence in the streets. But if Mrs. Merkel and her allies cave to Mr. Tsipras, the costs will be even more severe. The message will be that Europe’s other debtor nations can also use political extortion to block pro-growth reform. Parties of the left in Italy, Portugal and Spain will have a new argument to make against the reforms that have begun to show some progress: Vote to reject the reforms that creditors demand, and the creditors will reward you anyway. This could doom the center-right Spanish government of Mariano Rajoy as it goes to the polls later this year.